Hours: Monday, Wednesday and Thursday 7:30 a.m. – 6:30 p.m.
Tuesday and Friday 7:30 a.m. – 12:00 p.m. Physical Therapy involves the evaluation and treatment of movement dysfunctions and pain. A movement dysfunction may arise due to injuries or various diseases affecting the human body. For example, both a total knee replacement and a stroke produce movement dysfunctions and both are treated in physical therapy. Pain may also arise from any system in the body and in some cases physical therapy can be very successful in the treatment of pain. A physical therapy session involves collecting past medical history, performing tests to identify problems and establishing a plan of care. 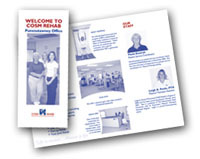 Generally, a patient’s treatment will involve modalities (heat, ice, ultrasound), manual techniques (massage, passive range of motion) and therapeutic exercise such as aerobic exercise, strengthening and balance training. What is Occupational Therapy, Hand Therapy and Work Hardening? Occupational Therapy is a healthcare profession that provides service to individuals whose lives have been disrupted by physical injury, illness or developmental problems. Occupational Therapists evaluate a person’s ability to perform activities of daily living (ADL’s) involving work, self-care and play/leisure skills. Occupational Therapists can modify or simplify daily tasks to promote maximum functional independence i.e. build up a handle on feeding utensils, long handle sponge/reacher, energy conservation/joint protection. Hand Therapy is a branch of occupational therapy theory and practice that combines comprehensive knowledge of upper extremity function and activity. Using specialized skills in assessment and treatment, hand therapists promote restoration of function and/or reversal of injury to maximize performance of daily activities. Hand therapists teach exercise, apply modalities and create custom splints to protect from additional injury or impairment. Work Hardening is a structured and goal oriented treatment program designed to maximize a person’s ability to return to work. Work hardening uses real or simulated work conditions within a work environment to enhance return to work ability. Work hardening activities emphasize biomechanical, neuromuscular and cardiovascular abilities required to return to work. Custom Braces & Orthotics – We stock a wide variety and sizes of custom braces and support devices as listed below. These braces may be prescribed by your physician to assist in stabilizing the injured joint. Braces are covered by most insurance plans. Knee Braces – We provide custom orthotics to assist with a variety of foot conditions. A therapist will perform a thourough evaluation and make a cast imprint of the foot so that a proper fitting orthotic can be manufactured for the patient. Click here for photos of braces.